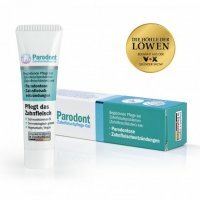 The Parodont gum care gel is suitable as an accompanying care for gum problems such as periodontal disease, bleeding gums and gingivitis. It contains black cumin oil and is dermatologically tested. Also suitable for vegetarians and vegans. Developed & bottled in Germany.